Chinese striped hamsters are not true dwarf hamsters but they are of a similar size to other small hamsters. As their name suggests, they are originally from China and Mongolia. Chinese hamsters are not commonly bred, can be hard to find at pet stores, and are also restricted in some places, such as the state of California where a permit is required to keep them. The natural coloration of a Chinese hamster is agouti (hairs are banded with light and dark colors) with a dark brown color on the back, a black dorsal line (along the spine), and ivory colored belly. These are cute pets, but keep in mind that while they don't require much in the way of enclosures and are easy to feed, hamsters do need a lot of stimulation, and Chinese hamsters are tiny, making it easy for them to escape if not supervised. Chinese hamsters are nocturnal but they may also be active for short times during the day. They are somewhat timid but are generally good-natured and rarely bite. They are small enough to squeeze through the bars on many hamster cages. If you don't have a cage specifically designed for a dwarf hamster, an aquarium may be a safer choice for housing these little rodents. They can also easily disappear while you are playing with them outside of their cage, so you must be extra careful and watch them at all times. Because they are so small and quick they can be a real challenge to handle, especially for kids. They are very active and require a large cage to prevent boredom. Otherwise, they may resort to getting cranky, have a suppressed immune system, and chew everything and anything they can get their teeth on. There is some disagreement among experts about the social characteristics of Chinese hamsters. As they mature, Chinese hamsters, especially females, may become aggressive with others and may need to be separated. However, other owners have managed to keep them in pairs or groupings (only when they are introduced at a very young age) which requires a fair amount of space for these active little hamsters to live in. To be on the safe side, plan on housing Chinese hamsters separately, only keeping them together if they show no signs of aggression towards each other. Basic care for pet Chinese hamsters is like that of other hamsters. A wire hamster cage may not be escape proof for these little hamsters, so an aquarium or another solid-sided cage with a secure top is preferable. The larger the cage, the better. Avoid cedar or pine wood shavings and keep the hamster's cage clean. Dirty cages accumulate urine. This produces an ammonia build-up since ventilation is diminished with solid-sided housing. Aquariums and other solid-sided hamster enclosures need to be kept cleaner than a wire sided enclosure due to this lack of ventilation. Remember that Chinese hamsters are tiny, so make sure its enclosure is in a place where you or other family members can monitor it. If they escape, the chances they'll get stepped on or suffer a fall are pretty high. Feed your pet a good-quality hamster food supplemented with small amounts of fresh foods including vegetables. 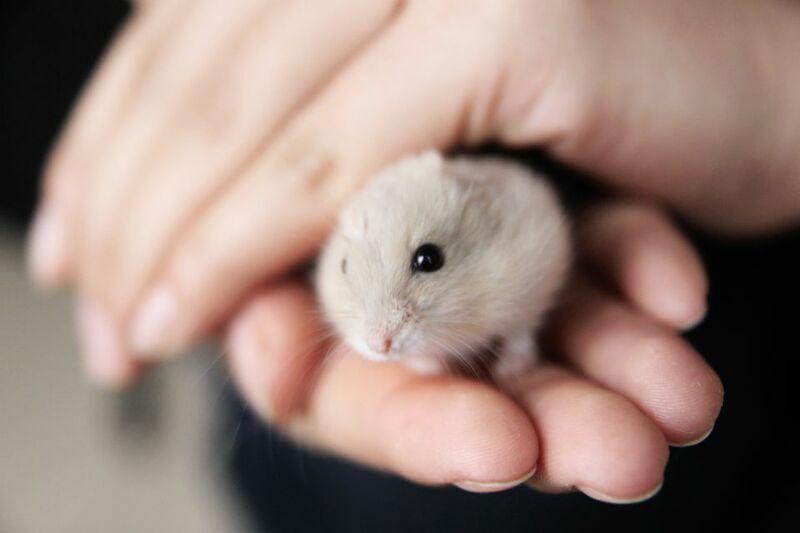 Small treats like nuts, fruit, cereal, and crackers can be offered to help your little hamster become hand tamed. Some pet stores sell hamster feed, but for the most part, these pets do just fine with fresh fruits and vegetables. Different hamsters have different dietary needs, so don't choose a generic mix for your Chinese hamster. It may not be what the animal needs to stay healthy. Wet tail is a very common illness in rodents, especially hamsters. Formally known as proliferative ileitis or regional enteritis, wet tail is a highly contagious disease believed to be caused by a bacteria called Campylobacter jejuni. A hamster with wet tail usually has appetite loss, is lethargic, and may have diarrhea. Seek veterinary care if your hamster shows any of these symptoms; wet tail can be fatal if not treated in a timely manner. Hamsters also are prone to respiratory infections. Symptoms are similar to what you would see in a human with a respiratory infection: wheezing, nasal discharge, sneezing, and lethargy. This condition also requires treatment, ideally by a veterinarian with experience caring for rodents. Perhaps the toy most associated with the hamster is the hamster wheel, and with good reason: hamsters need a lot of stimulation and get bored easily. They love running in hamster wheels and playing with other toys. A bored hamster is usually an irritable or destructive hamster; be sure if you have a child who will be caring for the hamster that he or she knows play time is important for this pet. Encourage children to interact with the hamster (under close supervision), which also is good for the animal's mental health. Hamsters are easily found at most pet stores, but if it's possible to get one from a reputable breeder, that's ideal, so you have access to its health history. Chinese hamsters live short enough lives; you don't want to get one that's sick and lose it in a short time. You also don't want to accidentally purchase a pregnant hamster, which presents a whole different set of housing and feeding challenges. Choose a hamster that seems attentive and active. Any signs of lethargy or irritability may indicate a sick hamster. A healthy hamster will run around without discomfort, have teeth that are well-aligned and fur that is free of bald or ruffled areas. Otherwise, check out our other hamster profiles to help you choose your next pet.